We use variations of floor-time, and we incorporate RDI, some TEACCH, and plenty of Affinity Therapy. Everything is child-led, and using these methods has built an incredible trust between her and us – it helps when we need to push her just a little bit farther out of her comfort zone. We stim with her, join in with whatever she’s doing, and nowadays we get eye contact almost constantly (because she enjoys our interactions). She learns a lot of new skills all the time, and we do our best to ensure that she’s having a great time while doing so. 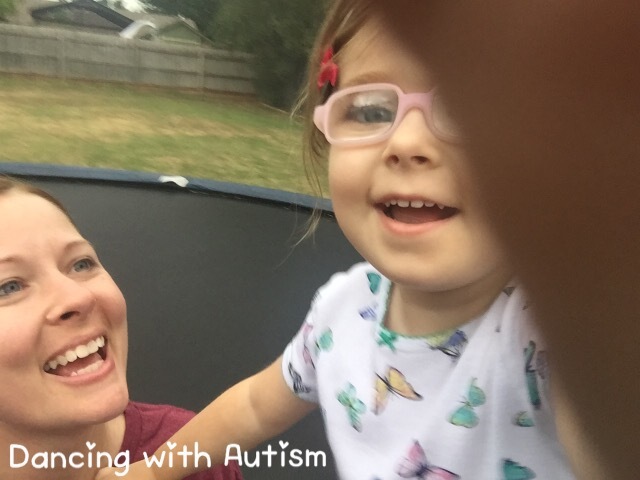 A lot of the time along with alphabet and numbers videos, she also tends to find videos to help herself work through some of her fears/anxieties: videos of other children playing at the playground, going outside, taking baths, playing with friends, etc. Almost always after a period of heavy iPad use, she presents with a burst of brand new skills. I don’t know exactly why it works, but it does work for her. And that’s all I need to know. We started EI therapy with Lila at 15 months old, and at that point she acted like Bill and I didn’t exist. I genuinely thought we had lost her. Thanks to Janet (our EI therapist with SoonerStart – now part of our family) – she helped teach us techniques we could use to build trust with Lila, ways to enter her world, and ways to help merge her world into our own. The first couple of months, we literally just followed her around the house, touching whatever she touched, making noises she made, and doing whatever she was doing (parallel to her at that point, anything closer or more invasive would trigger high anxiety). Play-Doh: she loves it, so I use it for speech therapy at home (ie I very excitedly say “orange!” with orange play doh in my hand. She loves it so she tries to mimic what I said). TV/Music: we did (and still do) use whatever songs/shows she’s into to help calm her down and take her mind off of something she’s anxious about. We also always use songs for transitions as well. She connects with music and it absolutely lights her up. I sing so much more now than I ever have in my life, and I dance just about as much as I did when I used to take/teach dance as well! First-Then Countdowns have been a life-saver in our house, and we use them for any and all transitions (First TV, then Bath – 5 more! Then 4, 3, 2, 1 more, then very excitedly NO more!). She loves it. As far as books I would recommend (I also get that questions a lot) – I would recommend that your first purchase should be “The Autism Discussion Page on the Core Challenges of Autism: A toolbox for helping children with autism feel safe, accepted, and competent” by Bill Nason. It’s been an incredibly useful tool for us. Floor-time therapy encompasses a lot of (similar) different approaches – it’s child-centered and encourages parents to follow the lead of their child, discover the child’s interest, elaborate and build on whatever the child is interested in and assist the child in his/her play rather than trying to direct the play in a particular direction. If a child turns away from interaction to engage in a solitary activity, then the facilitator follows the child and joins him/her in that activity. RDI® programs teach parents how to guide their child to seek out and succeed in truly reciprocal relationships, while addressing key core issues such as motivation, communication, emotional regulation, episodic memory, rapid attention-shifting, self-awareness, appraisal, executive functioning, flexible thinking and creative problem solving. Listen to them and learn from them, use side-by-side engagement, dancing, use of scripting dialogue away from the screen, use of fast-forward and rewind, and role-playing. Always remember that what is on the screen with them is a context as welcoming and familiar and manageable to the child as the context a neurotypical person feels in the stroll from the kitchen to the living room. They’re living in this place. Think of it like visiting their home. TEACCH developed the intervention approach called “Structured TEACCHing”, which is based on understanding the learning characteristics of individuals with autism and the use of visual supports to promote meaning and independence. TEACCH services are supported by empirical research, enriched by extensive clinical expertise, and notable for its flexible and individualized support of individuals with Autism Spectrum Disorder (ASD) and their families. Yesterday was the first time ever that our Little Lady played on the playground at special needs pre-K – we’re so proud of her!